The soul is dyed the color of its thoughts. Think only on those things that are in line with your principles and can bear the full light of day. The content of your character is your choice. Day by day, what you choose, what you think, and what you do is who you become. Your integrity is your destiny…it is the light that guides your way. This article is about two government agencies who lie to the general public to obtain their yearly budgets. It is about information often misrepresented by the Bureau of Land Management (BLM) and the Department of the Interior (DOI). Truthfully, it is about integrity, personal choices, and ethics in accord with government agencies and how they destroy values and ethics daily. The example shown is nothing more or less than what is ongoing, continuously, with these agencies. One instance like many others through the years, due to complacency within our government investigative and legal communities, essentially the checks-n-balance system within our government, no longer hold our government accountable what so ever, not doing their jobs. This must change, and change it will. . .
Also, within the example contained herein the Safari Club is mentioned, as it is used within the context of the Federal Court Ruling and the statements given by these groups afterward, yes a special interest group. It shows how information can be taken out of context, and how special interest groups use our government agencies and waste our tax dollars, for their purpose. The Safari Club throughout history and well documented, assumes their interests in hunting can exceed laws or ethics of any type here in America. They believe to have the “Right” to destroy America’s wildlife, exclusively. This includes the selective ability for the extinction of wildlife, with no qualification other than to belong to this club; whereas, the BLM and the DOI supports them and all the while using our tax money to do so, in this case liquidating wild horses from Public Lands, costing taxpayers $$$$ Billions! The Safari Club wants Wild Horses off Public Lands to make more room for Game Animals and for hunting purposes. They write a lot about horse grazing, but their misinformation in regard to horse-grazing shown to be false. Then there is abundant science, which also shows the Safari Club information erroneous. Also within this particular Federal Court Proceeding, the cost to the taxpayer to represent the BLM / DOI, and the court expense itself, was in excess of $1.9 million dollars. LEGAL MEANING: Standing to sue — in law, the requirement that a person who brings a suit be a proper party to request adjudication of the particular issue involved. The test traditionally applied was whether the party had a personal stake in the outcome of the controversy presented and whether the dispute touched upon the legal relations of the parties having adverse legal interests. One has got to wonder about the standards fitting for “Standing” to sue, as the Safari Club was there, certainly a special interest having nothing to do with America other than take something from us all, but with a counter-suite right beside the Department of Justice who represented the BLM. . .
And yet the truth, “The Calico lawsuit, filed pro bono by the law firm Buchanan, Ingersoll & Rooney (BIR), sought to stop the roundup of a proposed 2,500 wild horses from the half-million (500,000) acre herd management area complex, which is comprised primarily of publicly-owned lands. In a preliminary ruling, the Court agreed that the government’s practice of sending wild horses to the Midwest and warehousing them in long-term holding facilities as likely illegal. So we either understand or do not understand the complexity of law, or court room semantics compared to our English language. In this scenario it makes no difference. Then we have the facts. The facts in this case are, just as in so many of the court cases having to deal with BLM’s bad management of America’s Wild Horse Herds, quite real and strikingly in opposition to BLM or DOI management principles or laws. When we remove the window dressing of BLM jargon, as well as special interest group statements based mostly on greed and their narrow concerns, we can find truth. We then discover, in an obvious manner, these government agencies are concerned about the American Public’s acceptability of the term “Acceptable Abuse” but nothing to counter the problem of the actual abuse, one of many other problems with these agencies. Our tax money pays for the abuse and slaughter of Wild Horses. This is a well documented fact; whereas, death and abusive practices at roundups, and much more uncalled for and callous abusive methods prevails, not uncommon. Then from simple observation, it is apparent our government agencies management people directly responsible and indeed influence situations of abuse, inadequate techniques, incompetence, and just as often criminal activity (i.e. see PEER Report 1993 Undercover Investigation of BLM and the Wild Horse and Burro Program). From the start we can acknowledge the fact of removing the Wild Horses from Public Lands cannot be verified by proper scientific, or even numeric equations or formulas for a proper count of wild horses on Public Lands. The BLM simply does not have the capacity to perform or generate a proper Wild Horse Herd count what so ever. This controversy remains questionable due to the averaging technique and guess work (i.e. estimates) given to the public by BLM staff. The numbers simply do not, and previously over the years have not, held up to scrutiny or observance of actual numbers on the range. Never! As well, BLM staff and upper management have never allowed a head-count by Advocates, or by an independent group, of either Wild Horse Herds on the range or within any of the BLM holding facilities. Yet, taxpayers money is used to house wild horses that should never have been rounded up (per-roundup costing taxpayers $1 million to $30 million dollars) what so ever, storing them at a cost of $52+ million dollars per year, and that is just the holding facilities we know about for sure. Criminal behavior, skimming finances, and graft remains abundant. Another ugly and unforgettable fact about the BLM, this particular government agency, along with the Department of the Interior, remain the most litigated and costly agencies in American history. Not only do each of these government agencies have budgets comparable to many countries worldwide, but the criminality and tendency to support corporations and special interest groups with our tax money abounds and remains uncontrolled and unsupervised. Fee collection in many instances from these same corporations, or extremely low fees, far below commercial rates of land usage, remains abundant as well. Yes, criminal in nature. “Of the 1,922 Calico horses reported as captured by the BLM between December 28, 2009 and February 4, 2010, 86 horses have died to date. Dozens more sustained injuries as a direct result of the helicopter stampede, transport to short-term holding, or confinement in “feedlot”-type holding pens. An additional 40 heavily pregnant mares spontaneously aborted. 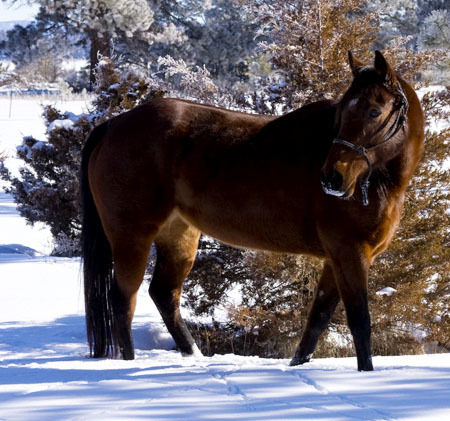 winter roundup when heavily pregnant mares are subjected to stress and trauma. As Americans we can come to good conclusions, not rhetoric or a stream of misinformation. We listen and observe BLM and DOI, and even some of their special interest groups rant and rave about Horse Advocates. We hear a lot of name calling, a lot of rhetoric toward their explanation of questionable situations, and a lot of references to data that either does not exist, or had been changed, or the data manipulated to such an extent as to become non-useful. All at taxpayer expense. We have all witnessed, at one time or another, the continuous abuse of America’s Wild Horse Herds and many have spoke up quite often — Yet ignored not only by the Inspector Generals Office at the BLM, but at the DOI as well. This is not appropriate and contrary to what our tax money should be spent upon, as there is no such thing as Acceptable Abuse, and especially unacceptable when a government agency allows such behavior on a continuing basis! So we can conclude that the Bureau of Land Management, an agency of the Department of the Interior, demonstrates throughout its history (both in management and criminality) to be in total conflict with the majority of American’s, in conflict with many of the laws existing favorable toward Public Lands management, and certainly in conflict with the management of America’s taxpaying dollars. Yes, BLM Management has a loop-hole, previously placed into their management paradigm, that they can develop and make decisions on a separate basis, the ability to disregard present laws and regulations, which can and has left the laws and good management paradigms useless — which many agree, the loophole should be withdrawn as null and void immediately. The Bureau of Land Management, for all intents and purposes, should be disbanded and many of the BLM employees, as well as private contractors, should be investigated for criminal conduct, especially due to the overwhelming abuse of our nation’s wildlife, in the misuse of taxpayer money, and the criminal conduct of many of the employees. American’s are fed up with the way government agencies treat our tax dollars, and fed up with the way government agency personnel treat the American Public! Enough is enough! It is time to rid our nation of such government agencies that consider themselves separate and apart from America and the American Public!